Moxa's AWK-4131A Series: Rugged Industrial Design. Easy Set-Up and Deployment - Allied Automation, Inc. 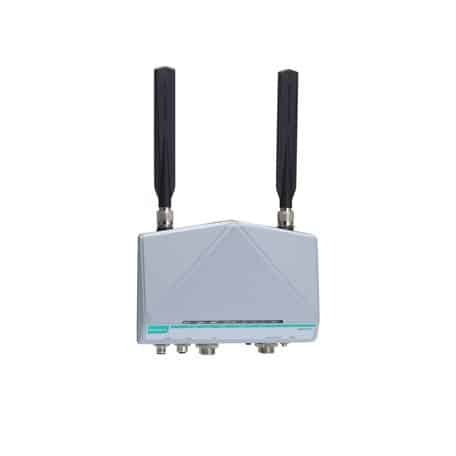 The AWK-4131A IP68 outdoor industrial AP/bridge/client meets the growing need for faster data transmission speeds by supporting 802.11n technology and allowing 2X2 MIMO communication with a net data rate of up to 300 Mbps. The AWK-4131A is compliant with industrial standards and approvals covering operating temperature, power input voltage, surge, ESD, and vibration. The two redundant DC power inputs increase the reliability of the power supply, and the AWK-4131A can be powered via PoE to make deployment easier. The AWK-4131A can operate on either the 2.4 GHz or 5 GHz bands and is backwards-compatible with existing 802.11a/b/g deployments to future-proof your investments in wireless networks.